We’ve all got them. Stashes i mean. It must be an intrinsic habit of the crafty-minded to acquire an abundance of materials for their trade. I’ve taken a bit of interest in other people’s collections, if only to make myself feel a little bit more normal. Some collect scrapbook paper, some fabric, some collect cooking ingredients like spices and cupcake liners. Still others collect scrap metal, car parts, driftwood and buttons. Despite all my inquiries, i do still feel that knitters and the fibre community are a unique breed. The most extreme case I personally know of is one of my friends who has resorted to renting a storage locker to contain her stash which still mysteriously continued to grow. As an avid knitter, and magpie, i live with a very real fear of being found buried alive under a mountain of delicious wooly cupcakes. Therefor, I have given myself a challenge. I have shaken hands with myself and agreed to knit solely from my stash. 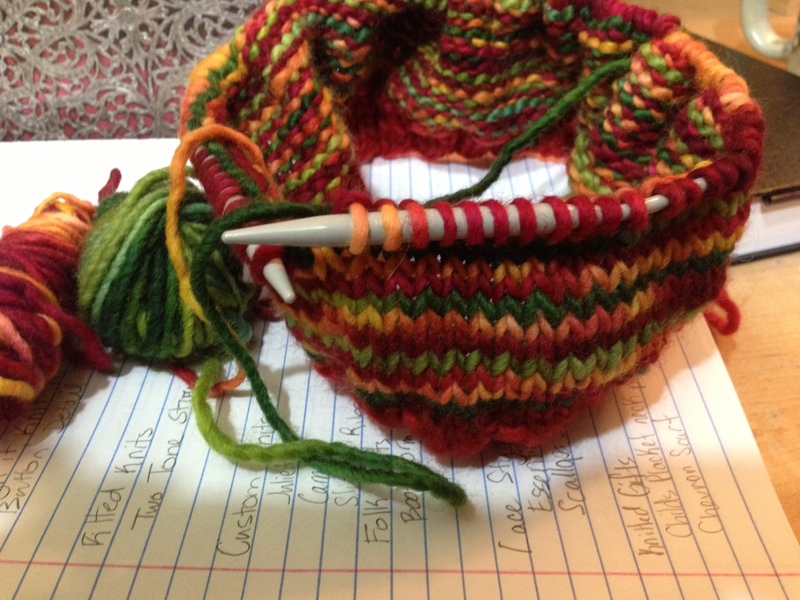 I celebrated by casting on a very simple hat in some worsted weight Malabrigo left over from other projects. I look forward to discovering new patterns that will help me work with what i’ve got. If anyone has any ideas please let me know! !